I felt the need to make a very “summertime” like milkshake for our second day of Milkshake Week! When I started brainstorming I immediately thought of Key Lime Pie. Every year my family and I spend a few days in the Keys. Typically around my birthday, but sadly this past year due to the birth of our son we weren’t able to make the trip. While in Key West I indulge in all things key lime pie. From key lime pie on a stick (yes, it’s frozen and amazing) to key lime pie martinis and hard candies… you get the point. It’s typically key lime overload for me. I love key lime pie. It’s definitely a pie that you have to have an acquired taste for. Sadly, my husband does not share my love for it (just as he doesn’t like bacon or mostly all things chocolate–I know, what is wrong with him?). 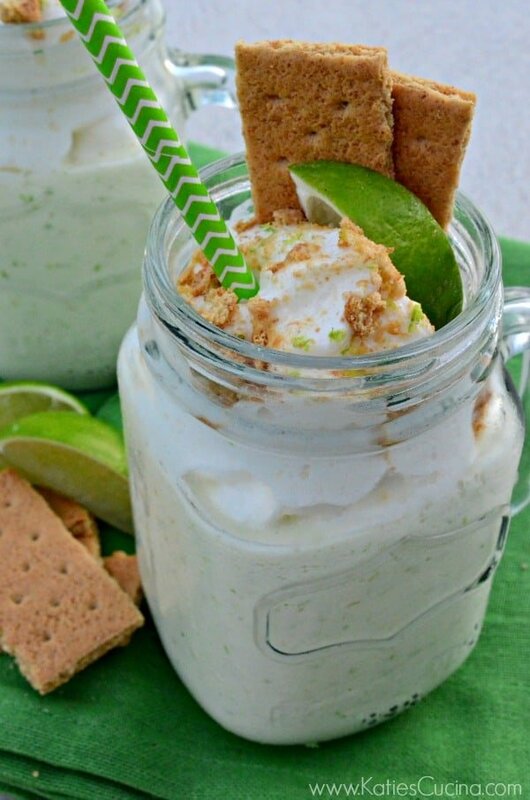 Naturally, Key Lime Pie Milkshakes sounded like a genius idea. And boy was it! 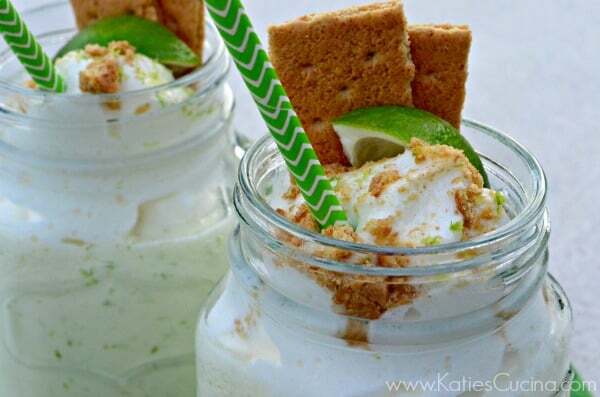 The tanginess from the limes and yogurt balanced out by the powdered sugar and graham crackers. I actually found myself using extra graham crackers to scoop up my milkshake. Think of the graham cracker like a spoon of sorts! I couldn’t find key limes when I went to make this recipe and I was out of key lime juice (darn me for rejecting the offer of my mother bringing me back a large bottle during their last trip down to the Keys), so traditional limes it was. “Some people believe that “key lime” simply refers to the limes that are used for making the pies, or limes that grow only in the Florida Keys. 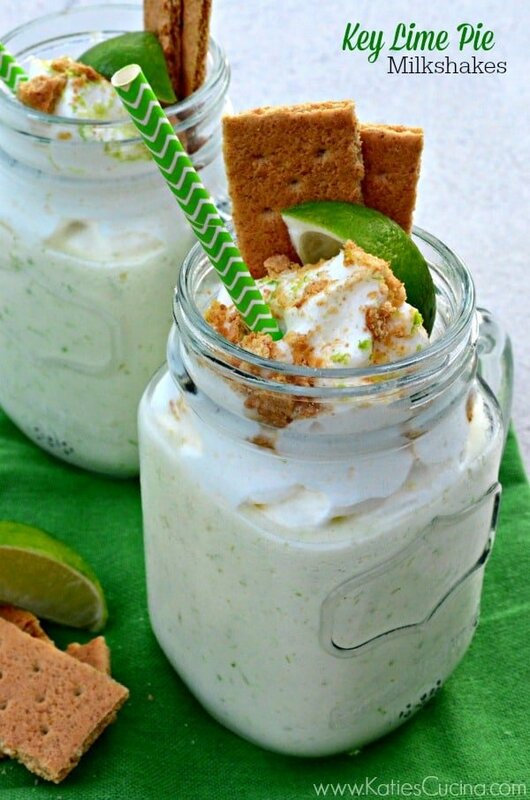 Actually, the key lime is a specific variety of lime. It is not exclusive to the Keys. It was brought there years ago and became naturalized. The key lime(Citrus aurantifolia Swingle) is in a class all of its own. Much smaller than regular “Persian” limes, the key lime ranges in size from a ping-pong ball to a golf ball (about 10cm to16cm in circumference). The peel is thin, smooth and greenish-yellow when ripe. The flesh is also greenish-yellow and full of highly poly embryonic seeds (two or more plants from one seed). The interior is divided by 10 to 12 segments, quite juicy and has a higher acidity than regular Persian limes. Key limes have a very distinctive aroma, which makes them valuable for culinary use. I can’t wait to give this recipe a try when I have actual key limes on hand. But until then the traditional lime variety will do just fine. Zest 2 limes, then cut in half and juice (zest and squeeze lime juice directly in blender). Add frozen yogurt, whole milk, and powdered sugar to the blender. Blend until smooth (about 10 seconds). Divide into two cups (or one large individual glass). Top with whipped cream. Sprinkle remains of lime zest on top of whipped cream. Crumble 1 graham cracker on top of whipped cream. Garnish with two quarter pieces of graham cracker and lime wedge. Enjoy immediately. *For a lighter milkshake use skim milk. Key limes or regular limes, this looks perfect! Ha ha I know… right. Who cares–just give me the milkshake!!! I did not know that about Key limes! What I do know is that I love them and I LOVE this milkshake. I’ll take two, please! I always knew there was a difference but didn’t know all the background about them. Either way… delish! LOVE this combo, Katie. So summery, perfect dessert to make for summer guests! Thanks Sandy! Yes–I could see these even being served in smaller shot like glasses. Gorgeous, Katie. Key Lime anything is at the top of my favorites, and I can’t wait to make this the next time I find Key Limes at the grocery store. I know I can’t wait to give it a try with Key Limes too! Such a gorgeous milkshake! I love Key Limes – they’re so tiny and cute! That is definitely my kind of milkshake! Looks great! Would love to try this with real key lime juice.